Happy New Year! I didn’t make any resolutions this year because let’s be honest, follow through ain’t easy! But, if you feel the need to make one go for it. But, keep this in mind; if you’re going to make resolutions, you’ll increase your chances of follow through by picking just one. Your chance of success with just one resolution is 80%. It drops to 30% when you add a second one and keeps on going down after that. Instead of making a resolution I’m going to do another reading challenge. 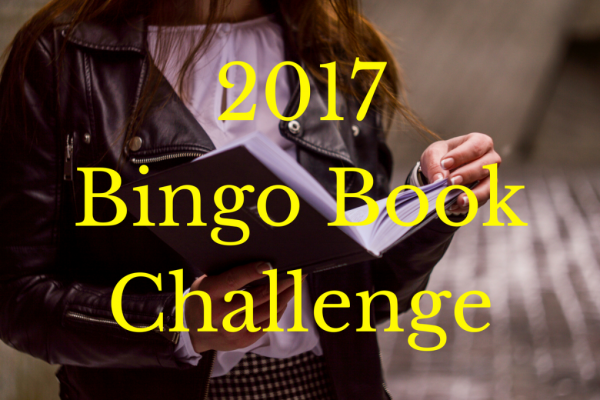 At the end of 2015 I proposed a reading challenge for 2016. Several of you said you wanted to join in so let me know what you ended up reading. Did you finish the challenge? I have to be honest, I didn’t get through all of the books I had chosen. I did manage to read 42 books but the book I’d chosen as “The Book that’ll draw me closer to God” was Randy Alcorn’s book, If God is Good. It’s a fantastic book but it’s 500 pages and reads a little like a seminary textbook, which means it’s not exactly light, relaxing reading. It also means I should have started it before the beginning of December when my main goal is just to read easy, light, books. But, I’ll finish it up in the next couple of months. The book I chose for the devotional category was Blessings for the Morning by Susie Larson. Susie has three “Blessings” books out and they are all great. I didn’t get all the way through this one because, quite honestly, I don’t do mornings well and once I finished my Bible reading, I usually forgot to pull it out. I’d remember about 4:00 in the afternoon – kind of late for a morning blessing. I could sit down and read it straight through in probably an hour or so but that would defeat the purpose of reading a blessing every day. So, again, I’ll finish it up this year. Now it’s time to focus on what’s next. The challenge I’ve given to myself this year is to skip buying any new books and instead make my way through some of the books I already own – either in a paper version or on my Kindle. Exceptions I plan to grant myself are books I need to buy for my book club and books that I can’t resist when my Book Bub email comes up with something that’s already on my list and is super cheap. 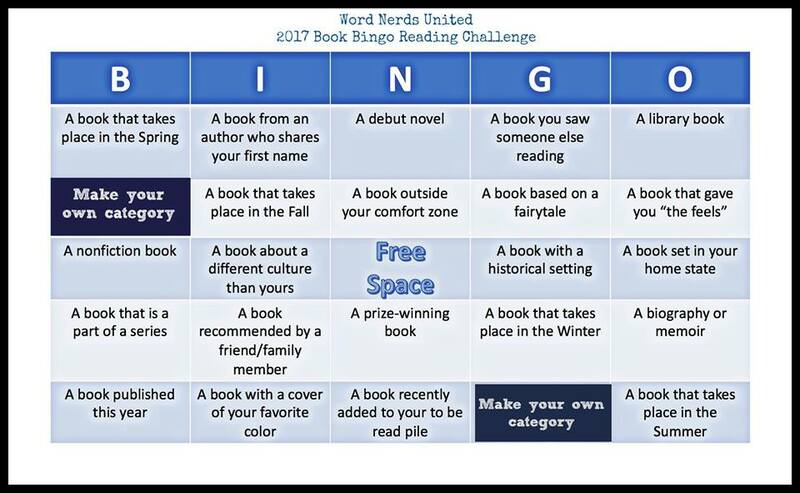 My friend, Sara Kennedy, hosts a Word Nerds United Facebook page for women who love to read and has come up with a fun Bingo Book Challenge for 2017. She has given me permission to share it here on my blog and has invited anyone who is interested to join the Facebook group. Just follow the link to join the group. It’s filled with people of all ages, backgrounds, and reading preferences so we’re always hearing about fun, new books (or old books that we haven’t read yet.) Here’s the challenge: Let me know when you get Bingo! As always you can go vertically, horizontally or diagonally to get to your goal. Or, hit every square and give yourself a high five! I hope you’ll join in the fun and share what you’ve read – perhaps giving me another reason to buy a new book! Go ahead – tempt me! Just sent you the list of my 2016 reads and it’s not even June yet! Woo Hoo! I clicked on the link for Word Nerds just now and requested membership. Are you going to host your own bingo game or just join the one on the Facebook site? What a fun idea! Glad you joined in, Sherry!